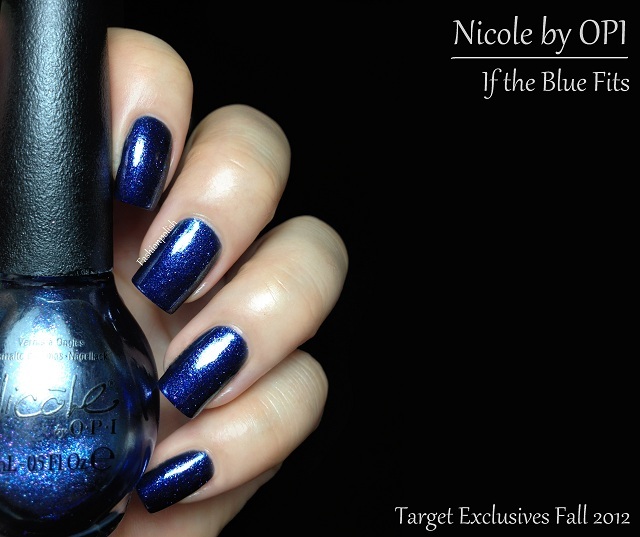 As of (almost) every season, Nicole by OPI has released a new exclusive collection. 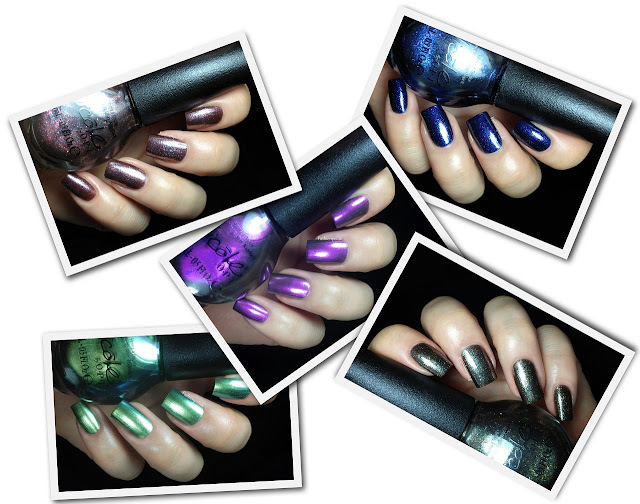 This Fall, the brand teamed up with Target to create duochrome metallics and rich shimmers. Mer-Maid for Each Other. Metallic green to blue duochrome. It's smooth and almost perfectly brushstrokes free but a dupe to many recent releases, China Glaze Unpredictable being the latest. This is two coats and no topcoat as TC doesn't affect final finish/shine. Iris My Case. Metallic purple to gold duochrome. The gold isn't very visible on the nail, except at extreme angles but you do see a color change on the edges. Again, a dupe to many recent releases, China Glaze No Plain Jane, Nails Inc Cheyne Walk,... This is also 2 coats and no topcoat. For Gold Times Sake. Now we're talking, the shimmer fest begins! This is such a complex shade that it would be reductive to try and categorize it in one color range. It's a complex mix of coarse shimmers ; gold, green, blue, pink, copper,... in what appears to be a sheer(ish) base. It's a very versatile color and will either pull on the warm or on the cold side depending on the lighting. I needed 3 coats for full opacity and depth. Just Busta Mauve. Very similar to For Gold Times Sake in terms of finish, it is, too, a complex mix of shimmers. I can see some pink, purple, blue, green, copper, gold,... Again, this is pretty versatile and will appear either warm or cold toned with the lighting. Also on the sheer side, it required 3 coats. If the Blue Fits. 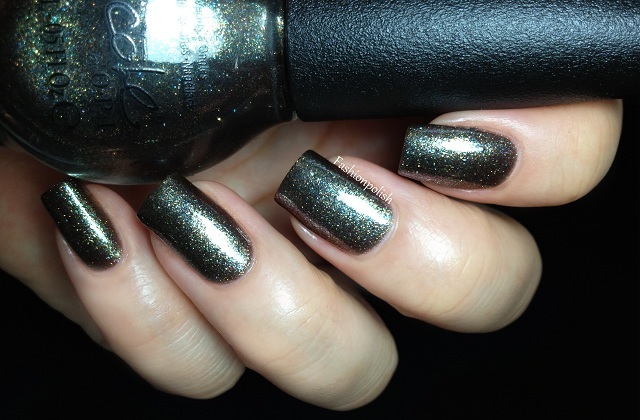 This is so glorious in the bottle with a strong blue, purple, green and gold multichrome! Unfortunately it's almost all lost on the nail and only very sparse purple shimmers will manage to peek through. I love it anyway as it's such a rich and vibrant blue! This one "only" took 2 coats to reach full opacity. These new Target exclusive shades are already available for $7.04 each at select Target locations nationwide and online at Target.com. Those are all such beautiful swatches! Love love love If the Blue Fits!! All of these are stunning! Just Busta Mauve and If The Blue Fits are my favorite, great swatches and reviews. Your swatches are perfect!!!! Also the colors are beautiful - still ist feels as if they created a "best of" of the colors released this automn and none of them strike me as unique. I love for Gold Time's Sake! I recived Just Busta Mauve in a swap a short while ago, but I didn't like it in person as much as I liked in on pictures. Love those shimmers! I can't buy NOPI though. The bottles aren't worth the pretty colors. I'm in love with For Gold Time's Sake! Love the gold and mauve one, can't wait to have target in My city ! Gorgeous polish and you take amazing photos!